While Hadrian was visiting the province of Egypt in late AD 130, his favourite, Antinous, drowned mysteriously in the Nile River. This tragic event led to the creation of a new divinity: Osirantinous, or Antinous as a manifestation of Osiris, the god who died and was reborn. One of our best sources for information about the new deity Osirantinous and the founding of Antinopolis, the new city created by Hadrian near the spot of Antinous’ death, is an obelisk found in Rome outside Porta Maggiore at the end of the 16th century. 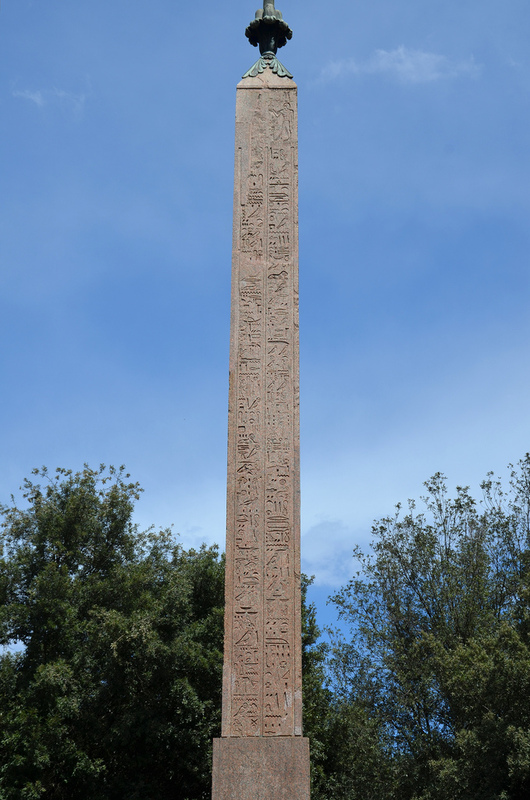 The Aswan pink granite obelisk, which now stands in the Pincian Hill Gardens, was commissioned by Hadrian after AD 130 to honour the deceased Antinous. 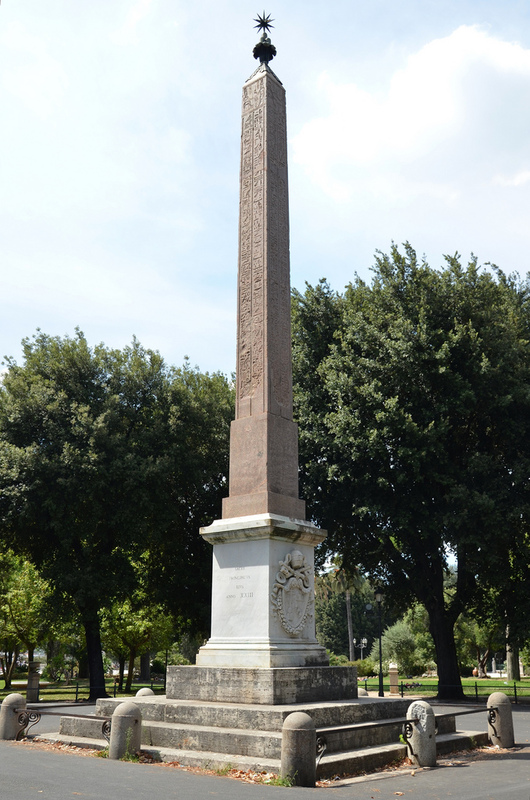 The Obelisk of Antinous (aslo known as the Pincian Obelisk or Barberini Obelisk) in its current location on the Pincian Hill in Rome. The obelisk was found in three pieces by the Saccocci brothers in their vineyards in 1570 and was later bought by Cardinal Francesco Barberini in 1632. It was then known as the Barberini Obelisk. Donna Cornelia Barberini-Colonna, a descendant of the Cardinal, donated it to Pope Clement XIV in 1773 who moved it to the Cortile della Pigna in the Vatican. In 1822 it was erected on the Pincian hill by Pope Pius VII where it still stands. Since then it has been known as the Obelisco Pinciano. “Obeliscus olim Veranus”, Rome. Engraving from Joannes Blaeu (1633). 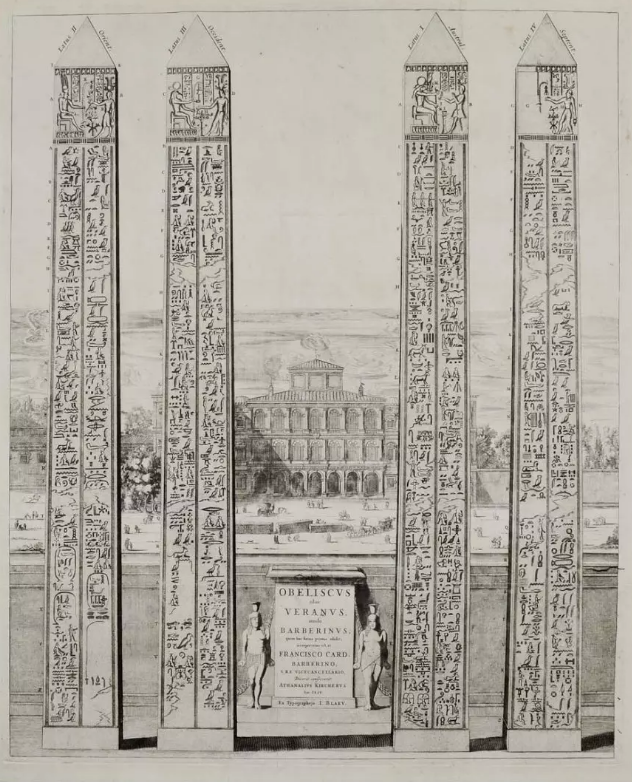 This engraving depicts the four sides of the obelisk of Antinous. In the background the obelisk is lying broken in three pieces in the court of the Palazzo Barberini in Rome. In the 3rd century AD, the area of Porta Maggiore along the Aqua Claudia was the site of an estate that belonged to the emperor Elagabalus. 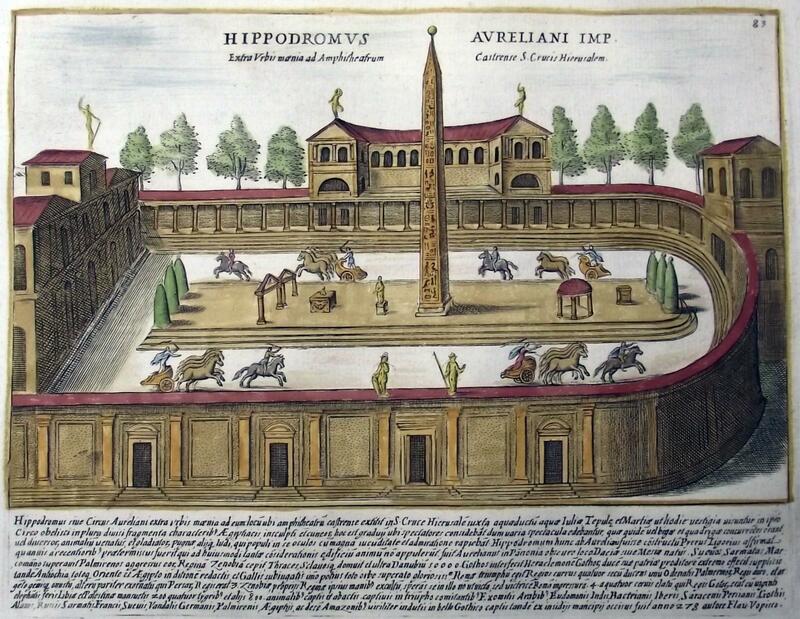 In the 1950s, excavations near the church of Santa Croce in Gerusalemme revealed the structures of a vast private Hippodrome known as the Circus Varianus. 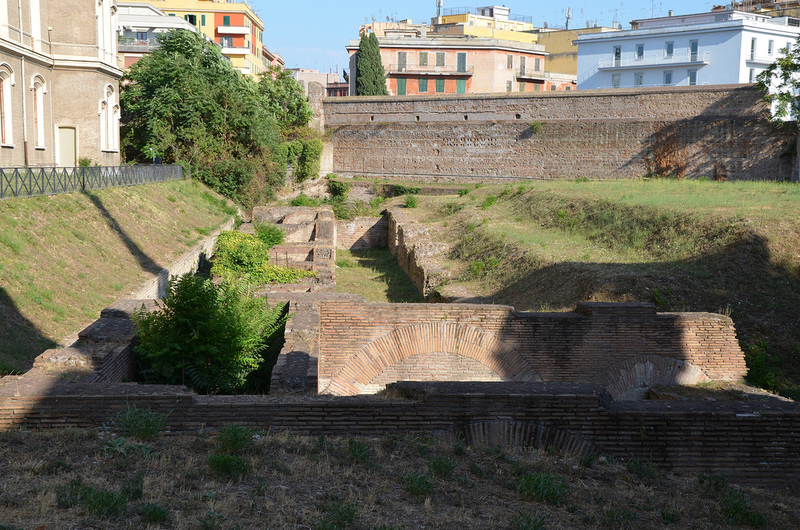 The remains of the Circus Varianus near the church of Santa Croce in Gerusalemme in Rome. The construction of the circus possibly started around the time of Caracalla who was fond of chariot races. Its original length is thought to have been greater than that of the Circus Maximus (about 640 meters) but the race-track was later shortened by Elagabalus who inherited the estate. It is now generally agreed that the obelisk of Antinous was unearthed in the Circus and that Elagabalus brought it here in order to decorate the spina (the middle strip). Scholars are divided over where the obelisk may have stood originally. It was long thought to have been brought to Rome from Antinopolis in Egypt in the 1st half of the 3rd century AD. 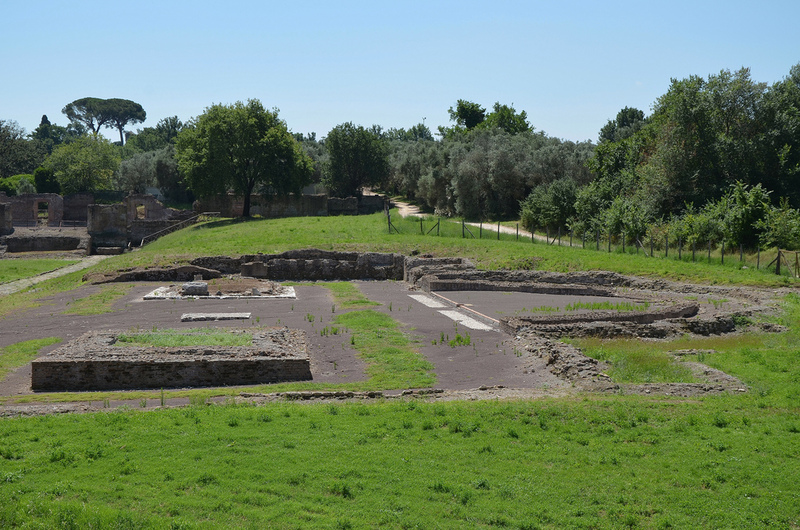 However, new archaeological research and an inscription on the obelisk implying that it stood in the “garden owned by the Prince of Rome” suggest that it may have been erected at the Antinoeion at Hadrian’s villa. The recent excavations at the imperial villa have uncovered the remains of a temple complex devoted to Antinous which consisted of two small tetrastyle temples (with four columns) facing each other in front of a semi-circular collonaded exedra. A square (3 x 3 m) concrete foundation located exactly between the two temples is thought to have supported an obelisk. View of the remains of the Antinoeion at Hadrian’s Villa. The foundation remains made it possible to reconstruct the plan with reasonable precision. Hypothetical reconstruction of the Temple complex. 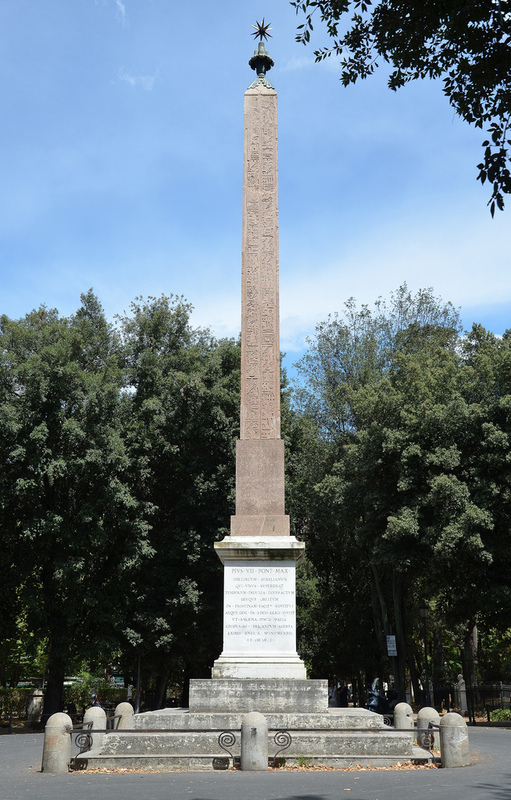 The excavators of the Antinoeion, Zaccaria Mari and Sergio Sgalambro, speculate that the Pincian obelisk was originally erected on the square base in the centre of the complex. 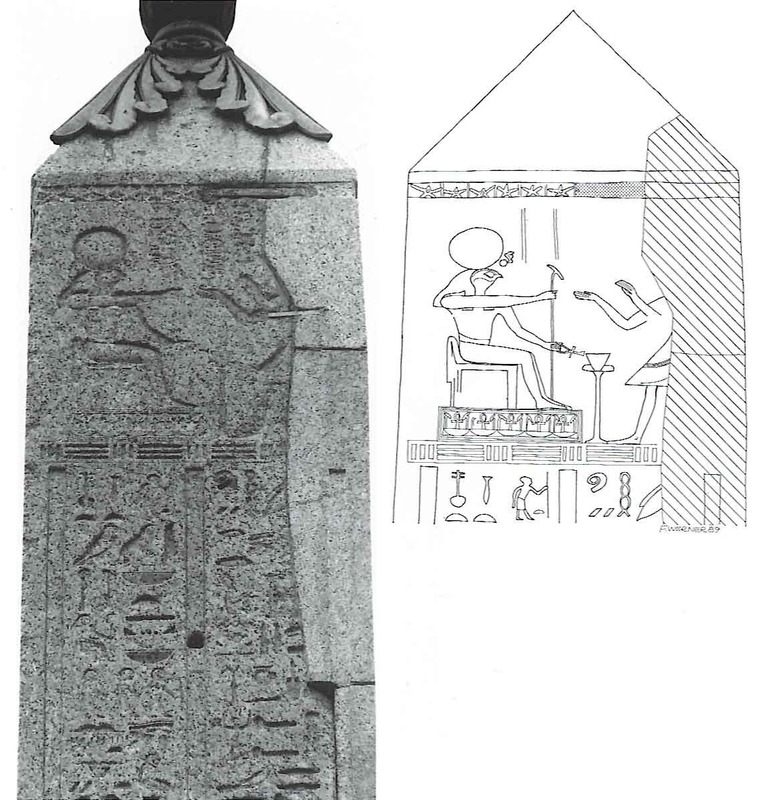 The hieroglyphic inscriptions on the obelisk seem to indicate that the obelisk marked the actual tomb of Antinous which led Mari and Sgalambro to suggest that the Antinoeion was the location of the tomb housing his remains. For them, the term “garden” mentioned on the obelisk clearly means Hadrian’s Villa. 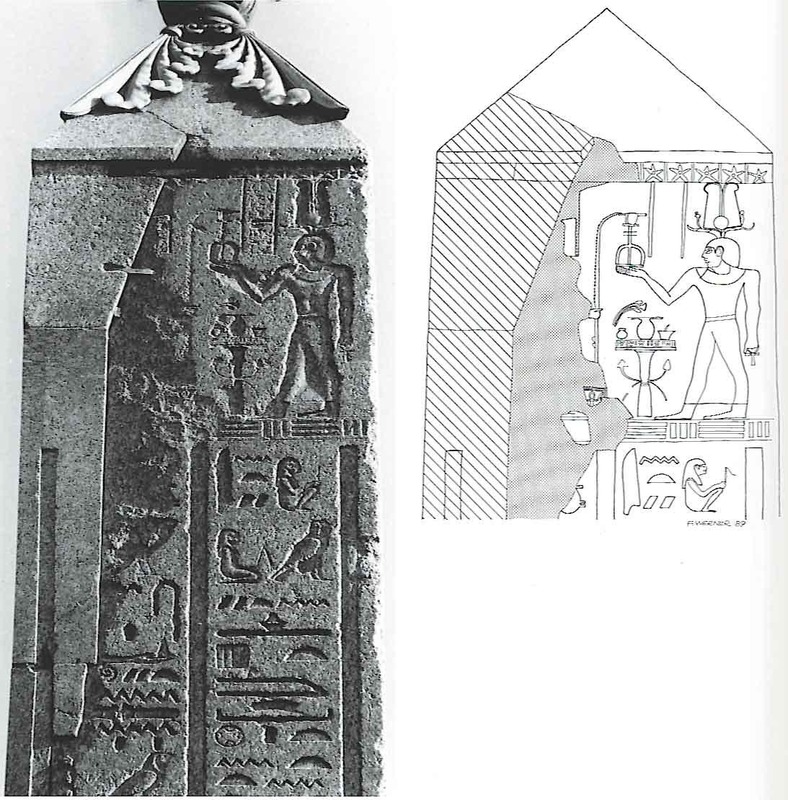 A number of pieces of Egyptian-style sculptures were found at the Antinoeion during the excavations in 2002 including Egyptianizing architectural fragments and a small head with pharaonic headgear (see image here). Other statues, found earlier, probably came from the Antinoeion, like the Antinous-Osiris (now in the Vatican) as well as the Harpocrates (now in the Capitoline Museums). In the mid-17th and 18th century, 15 Egyptian-style black marble statues of deities and priests were also unearthed (6 are in the Vatican Museums) as well as two telamons in red granite (colossal male figures used as columns – now in the Vatican Museums). They were all previously assigned to the so-called Serapeum, the monumental triclinium at the end of the Canopus. 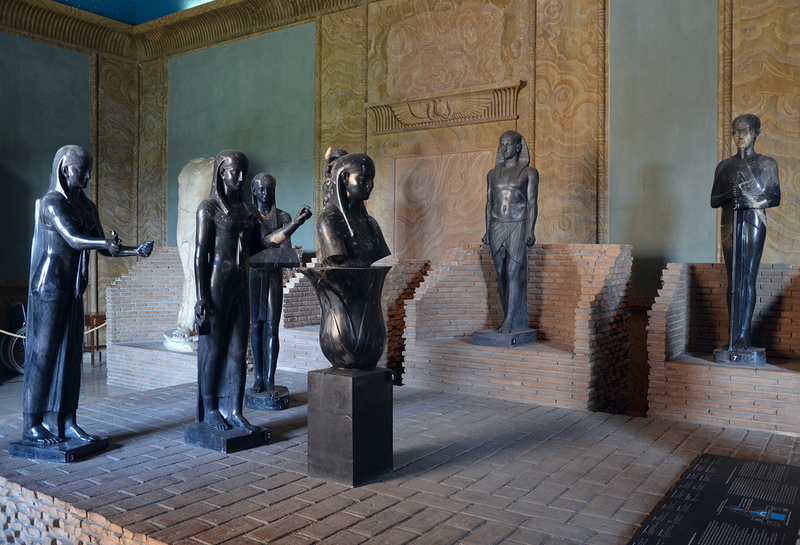 Egyptianizing sculptures from the Antinoeion at Hadrian’s Villa, 131-138 AD. Now in the Gregorian Egyptian Museum, Vatican. It has also been suggested that the Obelisk stood on the Palatine Hill in Rome in the Gardens of Adonis (Horti Adonaea, near the temple of Elagabalus) on the site of the present Vigna Barberini. Another hypothesis by the French Egyptologist Jean-Claude Grenier places it in the Horti Domitiae in which Hadrian erected his mausoleum. His theory is based on the research conducted by G. di Vita-Evrard (1) who claimed that the Horti Domitiae belonged to the mother of Hadrian, and not to Domitia, the wife of Domitian. For Grenier, it would be reasonable to believe that Hadrian erected the obelisk on the Roman estate which he inherited from his mother. The “garden owned by the Prince of Rome” mentioned on the obelisk could, according to Grenier, be the Horti Domitiae and not Hadrian’s Villa. In addition, Grenier translates the preposition “of ” with “in” thus translating it to “garden owned by the Prince in Rome”. 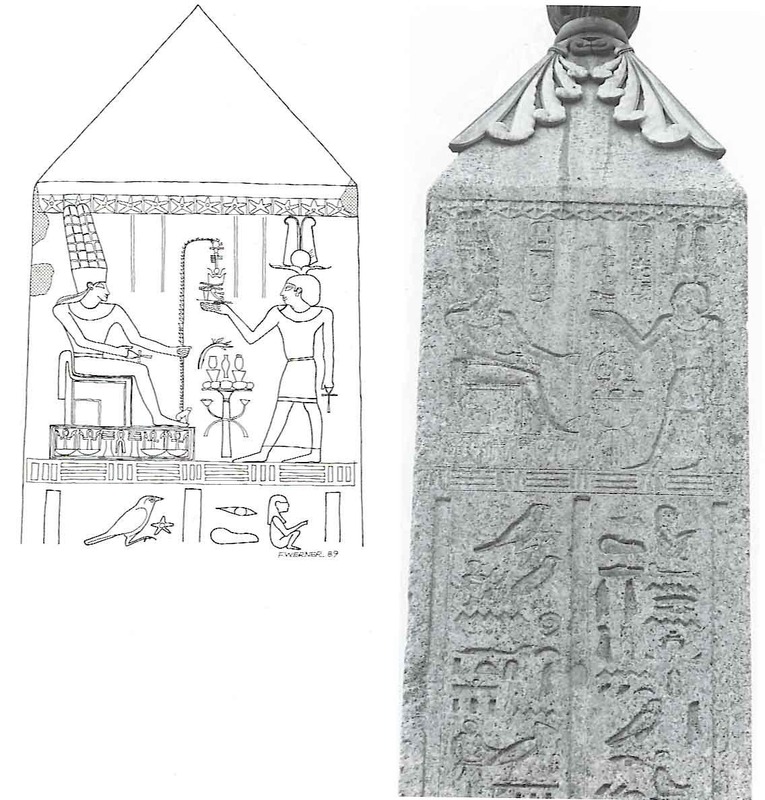 Clearly, its location depends on the accurate rendering of the hieroglyphics. 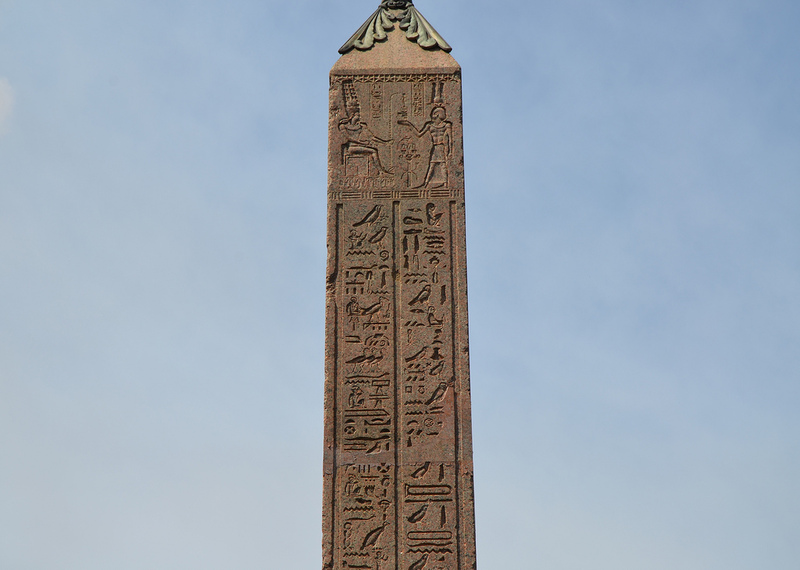 The four faces of the obelisk are covered with reliefs and hieroglyphs. The reference to Hadrian’s wife Sabina being alive on the eastern face of the obelisk shows that it dates from between Antinous’ death in AD 130 and Sabina’s some time in 136 or early 137. “The bulls and their cows breed lustily and produce their offspring for him [Hadrian], to gladden his heart and that of his great and beloved royal consort, the Lady of Both Lands (Upper and Lower Egypt) [Queen of Egypt] and the cities, Sabina, who lives, is safe and in health, the Augusta who lives forever”. Zaccaria Mari and Sergio Sgalambro tell us that the obelisk was certainly carved in Italy because of both its structural characteristics and the style of its hieroglyphics. 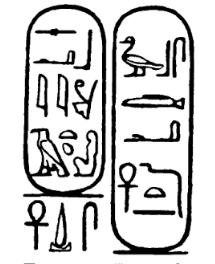 Indeed, due to the confused phrasing of the hieroglyphs, there have been various interpretations of the hieroglyph text which was translated from a text written in Latin or Greek into Egyptian hieroglyphs, a language that was long dead by Hadrian’s time. The obelisk hails Antinous as Osirantinous, the Reborn and Everlasting. 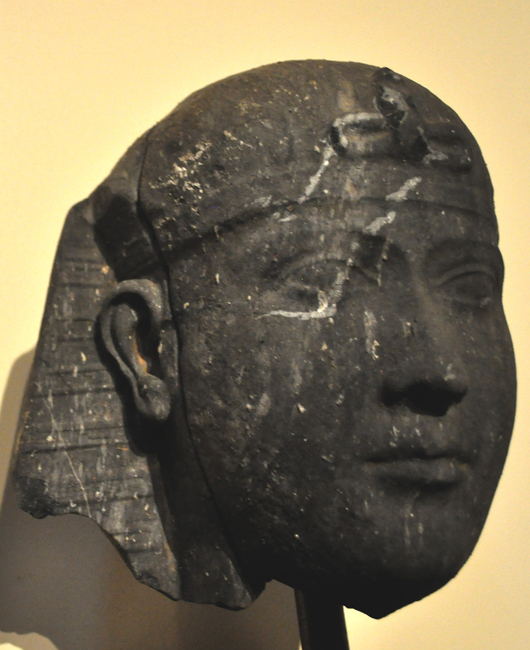 Like Osiris, Antinous was believed to have been reborn from the waters of the Nile and, although dead and buried in a tomb (the presence of which was probably marked by the obelisk), Antinous will live on forever. 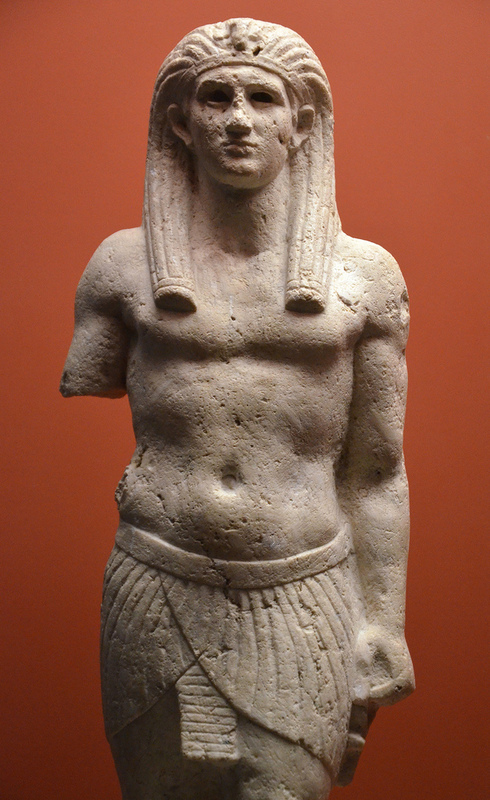 Statue of Antinous as Osiris, from Canopus (Egypt). Photo taken at the ‘Osiris, Sunken Mysteries of Egypt’ exhibition in Paris in 2015. The obelisk provides important information about Antinous, the new city Antinopolis, the temple of Antinous and his cult. It has a dedication on each side, one of which is in honour of Hadrian (east side). The other three sides are essentially devoted to Antinous as the new deity Osirantinous who is depicted before Thoth, Amun, and an indiscernible Egyptian deity (north, south and west sides). East side relief. Pharaoh Hadrian facing Ra-Horakhty. The east side relief depicts the Pharaoh Hadrian carrying an offering (missing) in his right hand to a seated falcon-headed god. The god is crowned with a sun-disk headdress and holds the sceptre in his right hand and the ankh in his left side. He is Ra-Horakhty. Horus was a god of the sky, and Ra was the god of the sun. Thus, Ra-Horakhty was thought of as the god of the rising sun. In the text below the relief, Antinous, blissfully happy in his apotheosis, requests the demiurge Ra-Hor-Akhty to reward Hadrian for what he has done for him by giving the Emperor and his wife Sabina a long and prosperous reign. Hadrian is referred to as “the ruler of every country” and a “lord of both lands ruling over both upper and lower Egypt. Hadrian’s wife gets a mention too and is referred to as the Queen of both countries. Sabina accompanied Hadrian and Antinous on their tour of Egypt and proof is given to us through a commemorative graffiti carved on the colossal statue of Memnon in Thebes by the poetess Balbilla, an attendant of Empress Sabina. South side relief. Antinous facing an indiscernible Egyptian deity. The south face relief depicts Antinous facing a god whose image is erased. Antinous is adorned with the Shuti Crown composed of two tall feathers with a sun disk placed on ram’s horns, a rounded cap wrapping his hair, a false beard, broad Usekh collar and a long kilt. South side of the Pincian Obelisk. The text below gives important information about the foundation of Antinopolis and the appearance of the Temple of Antinous; “[Antinoos] who is there (i.e. deceased), and who rests in this place, which is in the field of the lands (?) of the master (?) of…. of Rome, has been recognized as (?) a God in the divine places of Egypt. Temples have been founded for him, he has been adored as a god by the prophets and priests of Upper and Lower Egypt, and by the inhabitants of Egypt, all of them as there are. A city is named after his name…”. Antinopolis is described as a city populated by the “‘troops’ of the Greeks of the Two Lands and those who are in the temples of Egypt come here from their own places and are given cultivated land to make their life good beyond measure”. The text also describes his temple erected in this city which was “built of good white stone, surrounded by statues of the gods … and by numerous columns, made as they used to be made by our forefathers and also as they were made by the Greeks.”. West side relief. Antinous facing Thot. The west face relief depicts Antinous approaching the Egyptian underworld god Thoth. The ibis-headed god, crowned with a sun disk, holds in his left hand the sceptre and raises the ankh with his right hand. North face relief. Antinous facing Amun. The north side relief depicts Antinous, dressed in traditional Egyptian clothing, facing the god Amun while the text below describes the games held in honour of Antinous in the city that bears his name. “Antinoos, who is there (i.e., deceased) …a festival place (?) has been made in this city in Egypt, which is named for him, for the strong (youths) who are in this and, and for the rowing crews and for the… of the whole country and likewise for all the persons who are (?) with (?) the God Thoth, while there are prizes for them and crowns of flowers for their heads; they reward with every good thing. They place on his alters, they bring… daily which as daily (?) offerings (?). North side of the Pincian Obelisk. All translations were taken from Boatwright’s Hadrian and the City of Rome (who used the translations of Erman “Die Religion der Agypter”,1934) and Birley’s Hadrian: The Restless Emperor. (1) Ginette Di Vita-Evrard, « Le testament dit “de Dasumius” : testateur et bénéficiaires », Actas del coloquio internacional AEIGL, Epigrafia Juridica Romana, Pamplona, 1987, Pampelune, 1989, pp. 159-174. Birley, Anthony. Hadrian: The Restless Emperor. London, UK: Routledge, 1997. Boatwright, Mary T. Hadrian and the City of Rome. Princeton, NJ: Princeton University Press, 1987. For decades I have read disparate & contradictory reports and analysis on this obelisk. You have succinctly and successfully condensed the best and most logical information into one easily grasped and comprehensible article. “Thank you” for this, and always keeping us educated on your chosen subject matter! What a wonderful and informative post about the obelisk of Antinous, thoroughly researched and referenced. Well done! 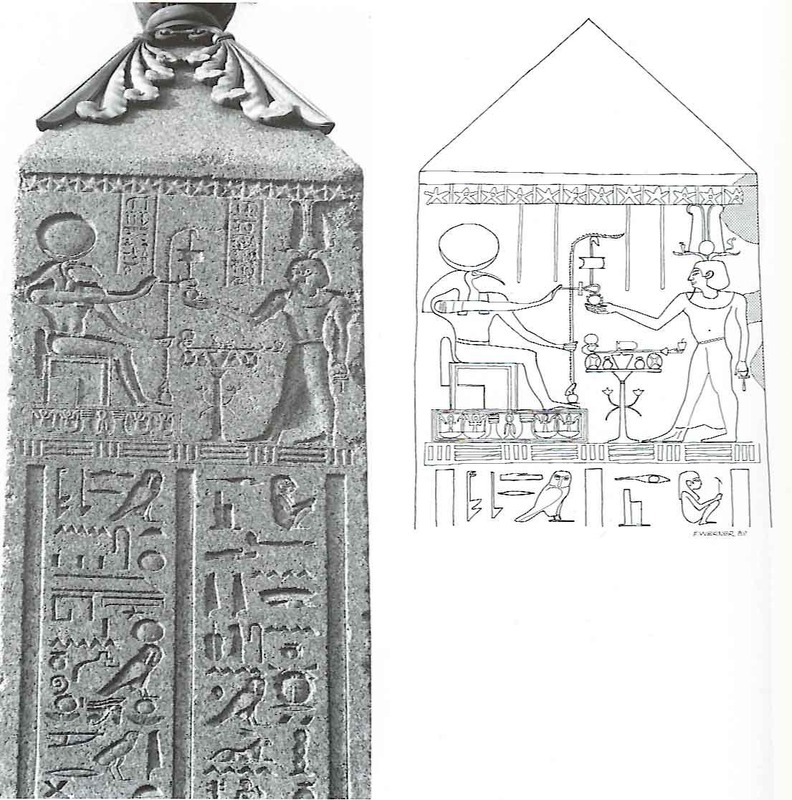 I have actually recently studied the subject, when I decided to use Antinous and the hieroglyphs from this obelisk for a coin design I needed. The Rosetta stone was carved just 300 years earlier, so I would hesitate to say that hieroglyphs were ‘long dead’ at the time, but language can certainly change fast. Very useful – thank you. It is good to hear solid information about such a curious cultus. It ought to be possible to collect all the testimonia on Antinous relatively easily? I wonder if there is anything in Demotic or Old Coptic?